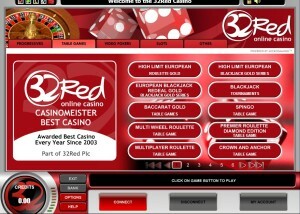 You are not a real online casino fan if you haven’t heard about 32Red. I agree 100% with the casino’s motto “second to none.” 32Red Casino is definitely one of my favorite Microgaming powered online casino destinations where I can play wide range of high quality games from a well-known and reputable software pioneer including live dealer and mobile casino games. The casino also offers arcade games, sports betting, online bingo and poker and it is part of the 32Red Plc licensed by the Government of Gibraltar. 32Red Casino has won many awards throughout the years, including ‘Best Casino of the Decade’ which say a lot about its professionalism and reputation. The company itself that operates the casino is UK’s premier online gaming company listed on The London Stock Exchange. Without doubt you will get safe, fun and quality gaming experience, reliable banking, generous bonuses and responsive player support; that is why 32red Casino is on top of my list of best Internet casinos. Since I’m a huge blackjack fan, I always sign up with online casinos that offer various blackjack games that are certified for fairness and have superb quality. Powered by Microgaming, I knew that I would find everything I need at 32Red Casino. I came across over 40 different blackjack titles in the download casino library and over 20 excellent blackjack variants in the instant play game portfolio which is more than enough. 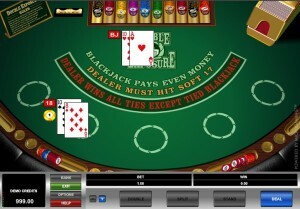 I immediately checked the games and in my option, the following are the top blackjack games: High Streak European Blackjack Gold, Bonus Blackjack, Spanish Blackjack, Atlantic City Blackjack, Classic Blackjack Gold, Perfect Pairs European Blackjack Gold, Hi Lo 13 European Blackjack, Bonus Blackjack and Double Exposure Blackjack. Moreover, if you are new to online blackjack, don’t worry because the casino caters to new blackjack players offering more info about the blackjack variants, game rules, strategies, how to play the game and demo version. This is simply amazing! If you like to play live blackjack from time to time like I do, visit the live casino department and pick a blackjack table. Not just blackjack fans, but other casino players can also join 32Red Casino since the casino offers over 500 online casino games, both in download and instant play formats. I also like to play slots from time to time so I was glad to see over 300 three and five reel slots as well as the most popular progressive slots in the lobby. The action packed Microgaming slots based on popular movies are my favorite like the Dark Knight Rises and Tomb Rider. The casino also offers various video poker games as well as dozens of card and table games. The casual games are a great way to spend your time earning quick cash. The best part is that all online casino games available come with short intro and tutorials. I was happy to see that I can play the blackjack games available at 32Red Casino and get $32 bonus for every $10 deposited. (€32 bonus for every €10, or £32 for every £10). The welcome bonus offer applies only to new players and if they decide to deposit more, they will get bigger bonus. The maximum is $160 bonus for depositing $50. All winnings from the bonus will be added to the bonus balance and are subject to 50 times playthrough requirement. If your primary reason for signing up with 32Red Casino is for playing blackjack, then you’ll be disappointed to see that blackjack games will contribute for only 2-10% of welcome bonus, so it’s going to be a long slog at 6.25 units per hand if you want to claim your bonus solely playing blackjack. The casino also offers other promotions like the Dish of the Day promo that gives you a delicious bonus every day. To claim the bonus, log in and follow the instructions in the casino lobby. The fans of the slots can take part in $250 Daily Freerolls which are exclusive slots tournaments running every day. They can play in the $250 Avalon slots tournament in the download casino and win a cash prize. 32Red Casino also gives red rubies rewards to loyal players for their regular play. Moreover, every Tuesday they can double or triple their red ruby points. The casino also picks depositors every day and sends them a red letter rewarding them with up to 250 free chips. Last but not least, high rollers and VIPs get bigger and better bonuses as well as other exclusive benefits in the Club Rouge. Club Rouge is invitation only for the sites high rollers and those that earn a ton of Red Rubies (loyalty points). Some of the benefits of being in the club include getting a birthday treat of 5,000 Red Rubies that you can instantly exchange for £50 cash. You’ll also be entered into a draw where lucky winners can receive 2 bottles of the finest champagne, cigars or chocolates. I own a Macbook from Apple running on iOS operating system so I was able to use the instant play version of the casino to play virtual Microgaming casino games. I also own an iPhone so I was glad to see that I can play a number of games on the go on it. 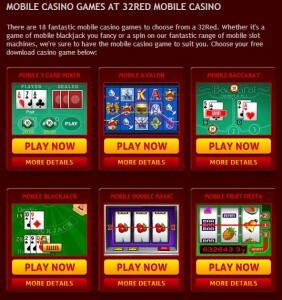 32Red Mobile Casino is suitable for iPads as well as for Blackberry OS and Android smart phones and tablets and many players can assess the games anywhere they are. In order to play mobile blackjack, I selected my phone type and country and entered my phone number and the provided security code. 32Red Casino offers plenty of methods to make deposits to and withdraw winnings from the casino. Some of them include major credit and debit cards, Neteller, Skrill, PayPal, Click2Pay, EcoCard, EntroPay, PaysafeCard, Ukash and direct bank transfer. The casino doesn’t pay any fees for deposit and withdrawals however a bank or a credit card issuer may charge you a significant fee for making transactions to and/or from online gambling sites. All deposits are instantly processed, while withdrawals normally take a couple of days to be processed. For example, credit card withdrawals take between 3 and 5 working days to complete. 32Red Casino is simply the best online casino destination. I like almost everything the casino has to offer- cutting edge software, top notch security, wide selection of games, various blackjack games, promotions and most importantly, easy to reach, responsive and helpful customer support service available 24/7. The casino is definitely the best place to play casino games in a safe and fun gaming environment. Every month, independent auditors review 32Red Casino’s payout percentages, so you can be safe in the knowledge that there;s nothing underhanded going on. All the reports are put up on the site, and for blackjack players, you can see that their payout percentage for table games for 2014 was between 97.51% and 98.95%.